Under ANCSA the state was originally divided into twelve regions, each represented by a "Native association" responsible for the enrollment of past and present residents of the region. Individual Alaska Natives enrolled in these associations, and their village level equivalents, were made shareholder in the Regional and Village Corporations created by the Act. The twelve for-profit regional corporations, and a thirteenth region representing those Alaska Natives who were no longer residents of Alaska in 1971, were awarded the monetary and property compensation created by ANCSA. Village corporations and their shareholders received compensation through the regional corporations. The fact that many ostensibly Alaska Native villages throughout the state were not empowered by the ANCSA to form village corporations later led to a number of lawsuits. During the 1970s, ANCSA regional and village corporations selected land in and around native villages in the state in proportion to their enrolled populations. Village corporations own the surface rights to the lands they selected, but regional corporations own the subsurface rights of both their own selections and of those of the village corporations. (12) Copper River Native Association ( Copper Center, Glennallen, Chitina, Mentasta). (d) Incorporation; business for profit; eligibility for benefits; provisions in articles for carrying out chapter. 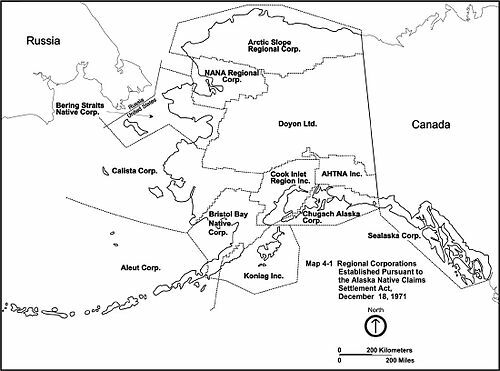 Five incorporators within each region, named by the Native association in the region, shall incorporate under the laws of Alaska a Regional Corporation to conduct business for profit, which shall be eligible for the benefits of this chapter so long as it is organized and functions in accordance with this chapter. The articles of incorporation shall include provisions necessary to carry out the terms of this chapter. There are over 200 village corporations, corresponding to the list of villages published in the text of ANCSA. Most corporations serve a single village, though some smaller villages have consolidated their corporations over the years. Atkasook Corporation Atqasuk Arctic Slope Regional Corp.
Brevig Mission Native Corporation Brevig Mission Bering Straits Native Corp.
Council Native Corporation Council Bering Straits Native Corp.
Elim Native Corporation Elim (Elim Reserve) Bering Straits Native Corp.
Elim Native Corporation St. Lawrence Bering Straits Native Corp.
Kaktovik Inupiat Corporation Kaktovik Arctic Slope Regional Corp.
King Island Native Corporation King Island Bering Straits Native Corp.
Koyuk Native Corporation Koyuk Bering Straits Native Corp.
Mary's Igloo Native Corporation Mary's Igloo Bering Straits Native Corp.
Nunamiut Corporation Anaktuvuk Pass Arctic Slope Regional Corp.
St. Michael native Corporation St. Michaels Bering Straits Native Corp.
Shaktoolik Native Corporation Shaktoolik Bering Straits Native Corp.
Shishmaref Natrive Corporation Shishmaref Bering Straits Native Corp.
Solomon Native Corporation Solomon Bering Straits Native Corp.
Stebbins Native Corporation Stebbins Bering Straits Native Corp.
Teller Native Corporation Teller Bering Straits Native Corp.
Unalakleet Native Corporation Unalakleet Bering Straits Native Corp.
Wales Native Corporation Wales Bering Straits Native Corp.
White Mountain Native Corporation White Mountain Bering Straits Native Corp.
^ "What Are Alaska Native Corporations?". ^ "Welcome to the Alaska Peninsula Corporation!". ^ "S449" (PDF). Archived from the original (PDF) on 2006-05-09. ^ "109-112" (PDF). Archived from the original (PDF) on 2006-05-09. ^ "TITLE 43--PUBLIC LANDS, CHAPTER 33--ALASKA NATIVE CLAIMS SETTLEMENT, Section 1606. Regional Corporations". United States Government Printing Office. Archived from the original on 2008-07-09. ^ a b c "Afognak – About". Afognak. Retrieved 22 March 2016. ^ "Afognak Native Corporation partner gets top NASA business award". Retrieved 22 March 2016. ^ "InsideView Directory". InsideView. Archived from the original on 2013-12-13. Retrieved 22 March 2016. ^ "Alaska Native Regional Corporation 2017 Review - Alaska Business Monthly - October 2017 - Anchorage, AK". www.akbizmag.com. Retrieved 2018-12-20. Gavin Kentch, A Corporate Culture? The Environmental Justice Challenges of the Alaska Native Claims Settlement Act, 81 Miss. L.J. 813 (2012). "Notice to ANCSA Shareholders: Compliance with Proxy Regulations" (PDF). Alaska Department of Commerce, Community and Economic Development. Archived from the original (PDF) on 2008-09-09. "Alaska, GOP Welfare State". Archived from the original on 2005-07-30. Alaska Natives & American Indians resources from the Justice Center, University of Alaska Anchorage. The Alaska Native Claims Settlement Act Resource Center run by Landye Bennett Blumstein LLP.